In this article, we will discuss the comparison between two body lotions that are often used to treat dry skin and keratosis pilaris. They are Amlactin vs Eucerin Body Lotion. They both can exfoliate the skin to remove dead skin cells and buildups while also moisturizing the area. So, which one is better? Body lotions are different compared to face lotions and hand lotions. Typically, body lotions contain ingredients that can increase hydration as well as sebum production. This is because, unlike the face and hands, the skin on your back, chest, shoulders, and legs doesn’t have many sebaceous glands, so these areas are more prone to drying and irritation. See also: Glytone vs Amlactin Body Lotion. Besides dry skin, another skin condition that is often treated by applying some body lotion is keratosis pilaris. According to WebMD, it is a harmless skin condition that creates small bumps on the skin and makes the affected area feel like sandpaper. Keratosis pilaris usually doesn’t hurt, but it may be accompanied with some itching, swelling, or redness. It is caused by a keratin buildup in the skin. 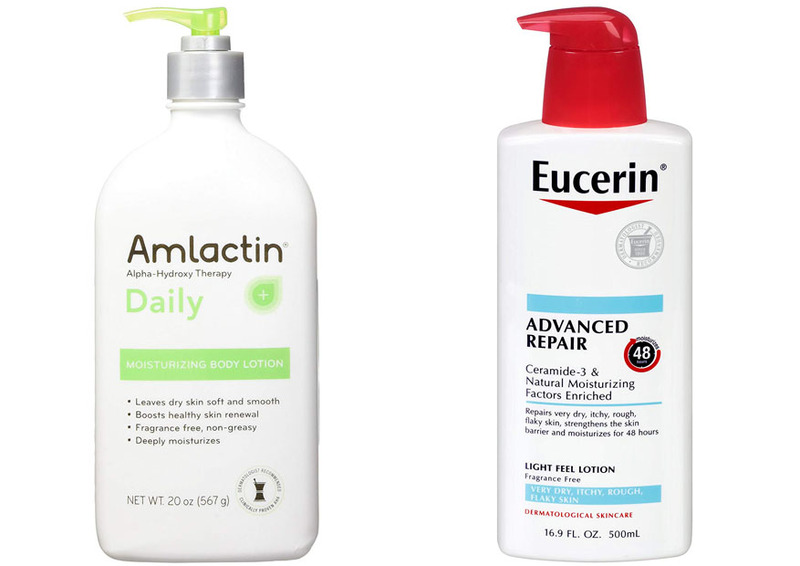 Body lotions like Amlactin vs Eucerin Body Lotion are effective for treating dry skin that is prone to irritation. Such body lotions can moisturize the skin and increase sebum production so that the skin doesn’t get irritated easily. Body lotions are often used for keratosis pilaris because it can reduce the appearance of the bumps. Such body lotions contain exfoliating ingredients that may help to remove dead skin cells and reduce the keratin buildup in the skin. Now, let’s see the ingredients of Amlactin. This body lotion claims to be the #1 moisturizer brand that is recommended by dermatologists for treating rough and dry skin. This body lotion claims to be able to exfoliate the skin gently and hydrate the skin intensely. The primary ingredient in Amlactin is 12% lactic acid. 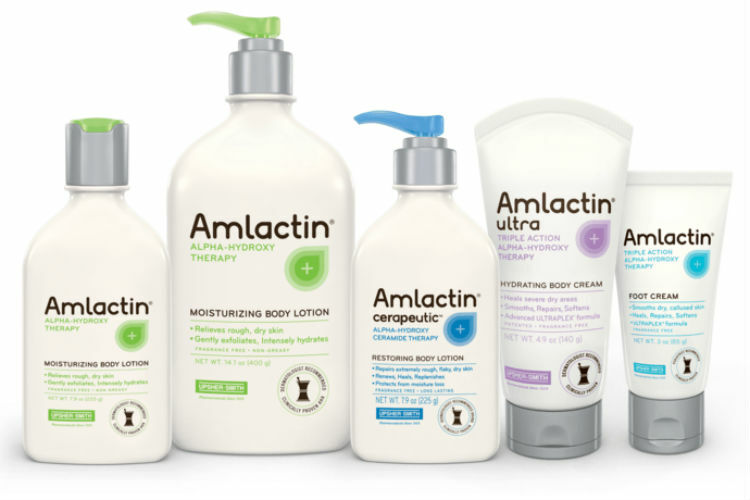 The ingredients of Amlactin include ammonium lactate (as the source of the lactic acid), water, mineral oil, glycerin, propylene glycol, glyceryl stearate, PEG-100 stearate, laureth-4, magnesium aluminum silicate, cetyl alcohol, PEG-40 stearate, propylparabene, methylparaben, and methylcellulose. 12% lactic acid is a good exfoliating ingredient. It is acquired from cow’s milk, and it belongs to the group of alpha-hydroxy acids. It is able to speed up the cellular turnover so that dead skin cells can be removed and fresh skin cells can come up to the surface. Another great thing about Amlactin is that it doesn’t use any fragrance. For the best results, it is recommended that you use Amlactin twice a day, or as directed by your physician. You may use this body lotion for a few weeks, but continuous use is not recommended because the exfoliating effects may make your skin sensitive. Amlactin is known to be highly effective for treating keratosis pilaris, eczema, and other skin conditions that involve bumpy patches. The medical-grade ingredients can help to treat dry, irritated, and damaged skin. The moisturizing effects also help to smoothen and refresh the skin so that dry, rough, and scaly patches can be eliminated. Within a few days, you will find that your skin has become smoother without visible bumps. The body lotion may leave a thin greasy layer on the skin. However, you don’t need to wipe it off. The thin layer serves as a moisture barrier that continuously hydrates your skin. Unfortunately, at the initial application, the body lotion may emit some faint smell of ammonia. Just like most other exfoliating body lotions, Amlactin vs Eucerin Body Lotion can increase your skin’s sensitivity. Your skin will also become more prone to sunburn. So, while using this body lotion, you should avoid direct contact with sunlight. Wear sufficient protective clothing when going outside. Eucerin Body Lotion uses quite a lot of ingredients. The ingredients include glycerin, urea, cetearyl alcohol, water, glycerylglucoside, sodium lactate, cyclomethicone, caprylic, shea butter, octyldodecanol, methlypropanediol, tapioca starch, dicaprylyl ether, hydrogenated coco-glycerides, sodium PCA, arginine HCL, glyceryl stearate SE, carrageenan, lactic acid, dimethiconol, carnitine, mannitol, ceramide 3, serine, citrulline, sucrose, glycogen, histidineHcL, threonine, alanine, lysine HCL, glutamic acid, sodium chloride, sodium cetearyl sulfate, phenoxyethanol, and 1,2-hexanediol. The primary ingredient of Eucerin Body Lotion is lactic acid. It does contain sodium lactate, but this is actually also a source of lactic acid. As mentioned above, lactic acid is an exfoliating ingredient that removes dead skin cells from the surface and replaces them with fresh skin cells. In addition, it also has glycerin, caprylic, and capric triglycerides, which are highly beneficial for moisturizing and conditioning the skin. 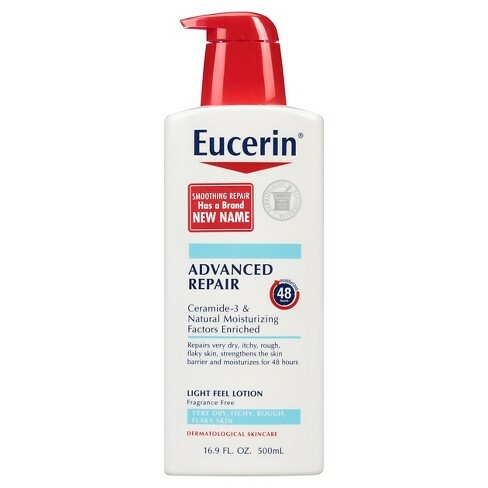 Eucerin Body Lotion is especially effective for treating dry, itchy, and cracked skin. It can deliver good noticeable results within a few days. It makes the skin smoother and more hydrated. This body lotion is also quite effective for keratosis pilaris. It can reduce and even completely eliminate the bumps. It is truly fragrance-free, without any significant scent. The texture is rich and creamy. It does leave a thin greasy film on the skin, which may make it feel sticky, but it is non-comedogenic which means that it won’t cause acne. It also increases your skin’s sensitivity and irritability. It is a bit more irritating than Amlactin. Such body lotions are not recommended for people with sensitive skin. While using this body lotion, avoid direct exposure to sunlight. You should wear protective clothing when going outside. Between these two products, Eucerin Body Lotion is generally more recommended. It uses lactic acid to exfoliate your skin. It has more ingredients that deliver moisturizing and conditioning effects to your skin. It is truly fragrance-free and odor-free without any significant scent, so you can use it without making any funny smell. Zevect.com is a participant in the Amazon Services LLC Associates Program, an affiliate advertising program designed to provide a means for sites to earn advertising fees by advertising and linking to Zevect.com (amazon.com, amazonsupply.com, or myhabit.com).